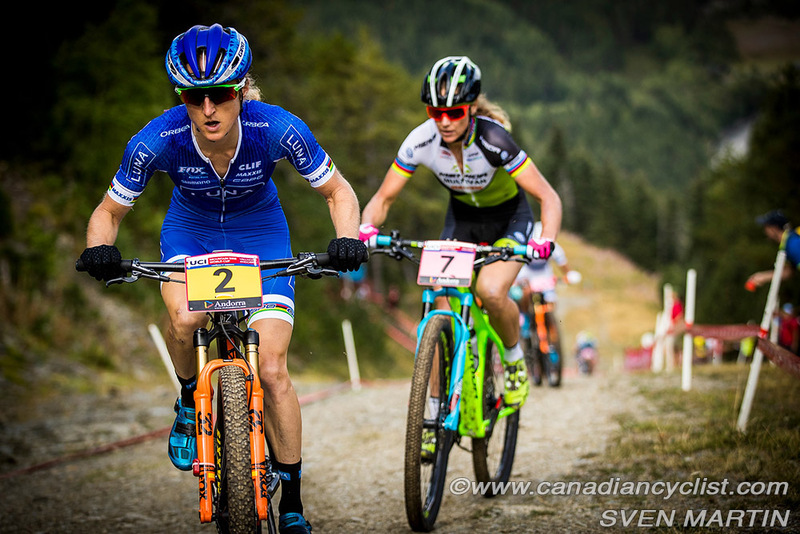 Catharine Pendrel (Luna) capped off a season that already includes an Olympic bronze medal with the overall World Cup title in Women's Cross-country on Sunday, in Andorra. Pendrel finished third in the sixth and final round of the series. Emily Batty (Trek Factory Racing) finished 12th in the race and third overall in the World Cup. It is Pendrel's third World Cup title. In the men's competition, Julien Absalon (BMC) came back from a disappointing Olympics to win his 33rd World Cup and take the seventh World Cup overall title of his career. Riders faced vastly different conditions than the ones they had trained on, when heavy rain overnight made the rocks and roots very slippery. The altitude, at over 1800 metres, also proved to be a significant factor, with many riders hitting the wall after a fast start. Pendrel attacked at the start of the race, hoping to put a gap between herself and World Cup leader Annika Langvad (Specialized), who began the race with a 56 point lead. Only Dahle Flesjaa was initially able to stay with Pendrel, and the duo began to open a gap until Pendrel crashed on the roots and was overtaken by Neff. The Swiss rider caught a fading Dahle Flesjaa on the fifth lap and then attacked on the sixth and final lap to win by 36 seconds, with Pendrel coming in at 1:21. Batty, who had crashed in training, raced with bruised ribs but moved up from 19th on the first lap to finish 12th. Langvad struggled all race and could only manage 13th, to drop to second in the overall standings. "It was incredibly tough [the final 2 laps]," said Neff. "I rode a new bike, a full suspension, so I didn't have back pain and that was better but my legs had to work in a different position so it was harder. It is incredible [to finish season with a win]. I couldn't be happier about the win. After having so many problems with my back that I could not solve, this gives me so much confidence for the winter to finish this season, to win a World Cup, I'm happy." Pendrel wins the overall title with 1030 points, in a season that included one World Cup victory, a second place and two third places. 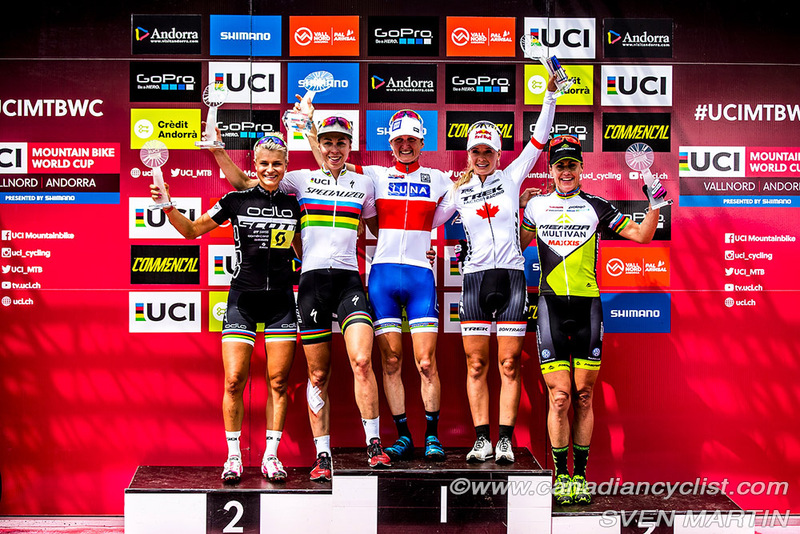 Annika Langvad was second with 1006 points, and Canadian national champion Emily Batty (Trek Factory) finished third with 710 points, including two third place results. 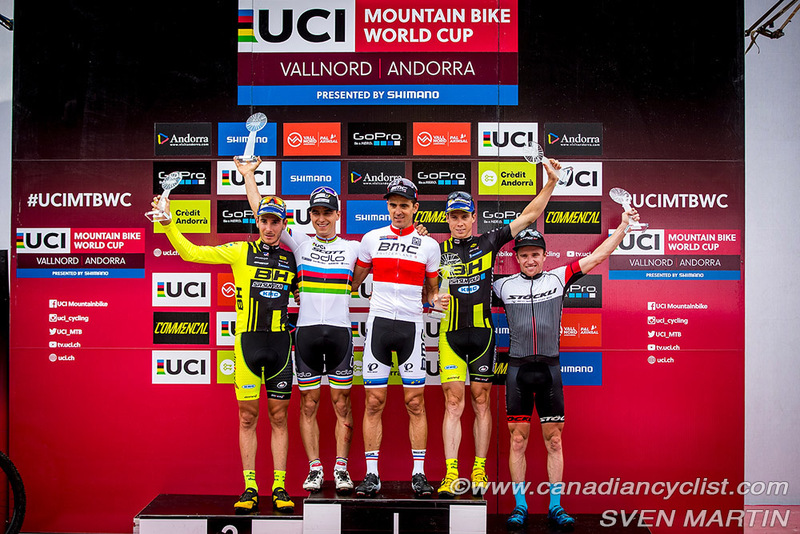 "World Cup Champion feels so good after the suffer fest out there today," said Pendrel. "This is an incredibly hard race. My start was amazing and I felt really good, but I definitely ran out of oxygen on the second lap and I really struggled on the descent. I had trouble staying up on the second descent, was kind of all over the place. I had to really regroup to get my breath. Then it was just about damage control; going as slow as I could just to stay upright on the descent and then hammer on the climb. Luckily I regrouped enough to settle into third position and hold it to the line. It wasn't the prettiest race but it got the job done. It was definitely one of the toughest races I have done so was incredible to be rewarded with the World Cup overall title." Carlos Coloma (MMR Factory) led out of the start loop on the mens' seven lap race, but was soon supplanted by Ondrej Cink (Multivan Merida), closely followed by Absalon and Olympic champion Nino Schurter (Scott Odlo). Absalon and Schurter made their way up to Cink by the fourth lap, but Schurter suffered a slow leak and was dropped when Absalon attacked. 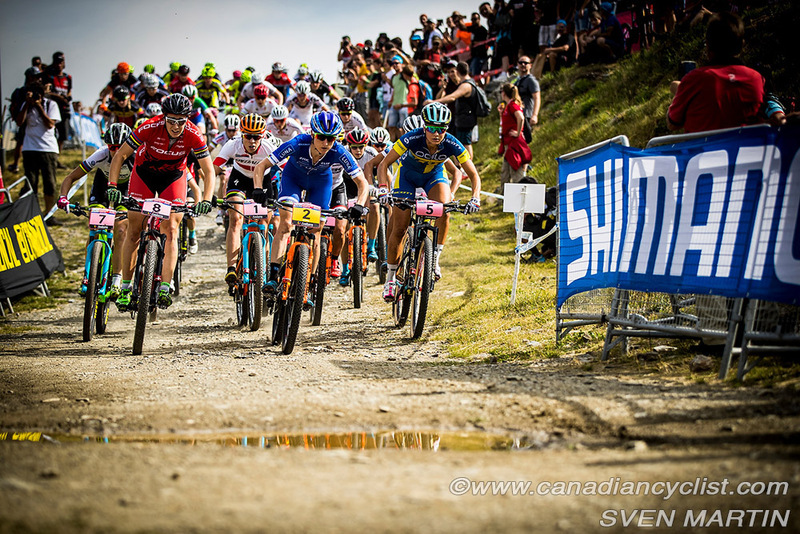 By the end of the fifth lap Absalon had 17 seconds on Cink, and increased that to 43 seconds by the finish line. Pablo Rodriguez (MMR Factory) took third in a sprint with Maxime Marotte (BH-SR Suntour-KMC). 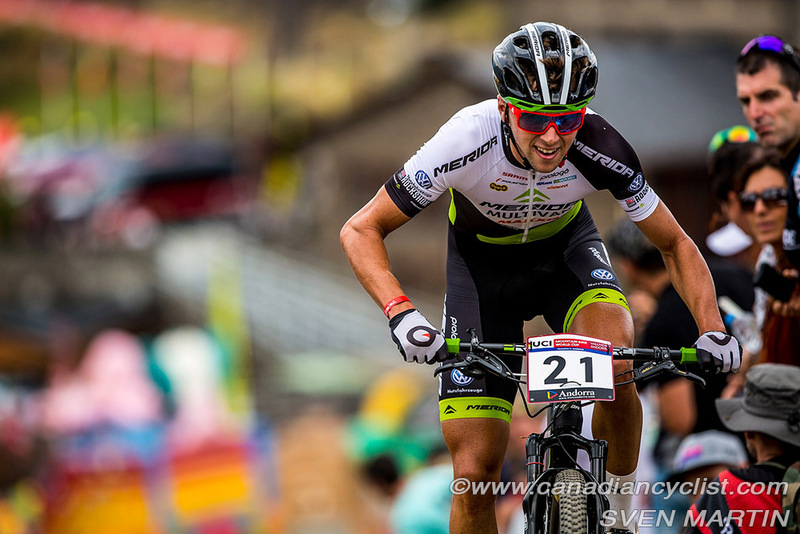 Andrew L'Esperance (Norco Factory) was the only Canadian entrant, finishing 57th. "After the Olympics I was really disappointed," said Absalon, "so the first goal was to win the overall and then the race today. My legs were perfect, and I was really motivated to do a good race, so the plan was to stay with Nino at the beginning of the race and after to attack him at the end. The fast pace at the start was a surprise, because here you don't want to go over the limit, because it is really high [altitude], but I was always in a good rhythm." 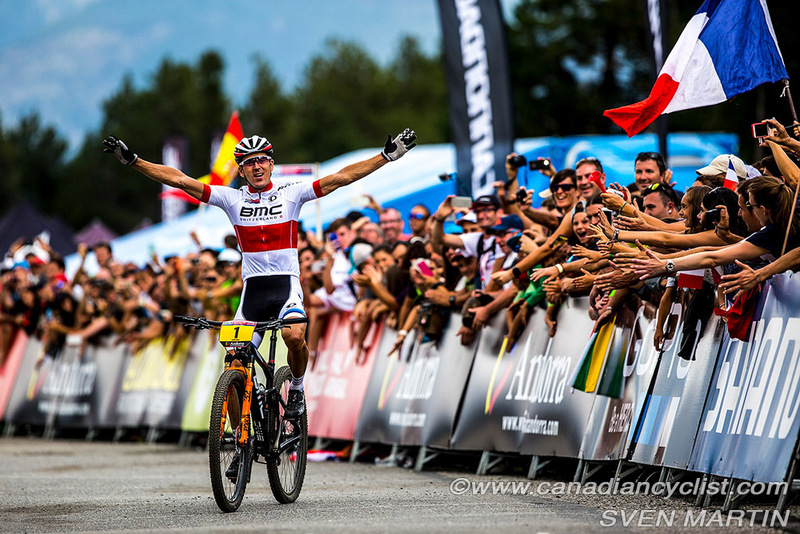 Absalon finishes the season with 1310 points and three World Cup victories. 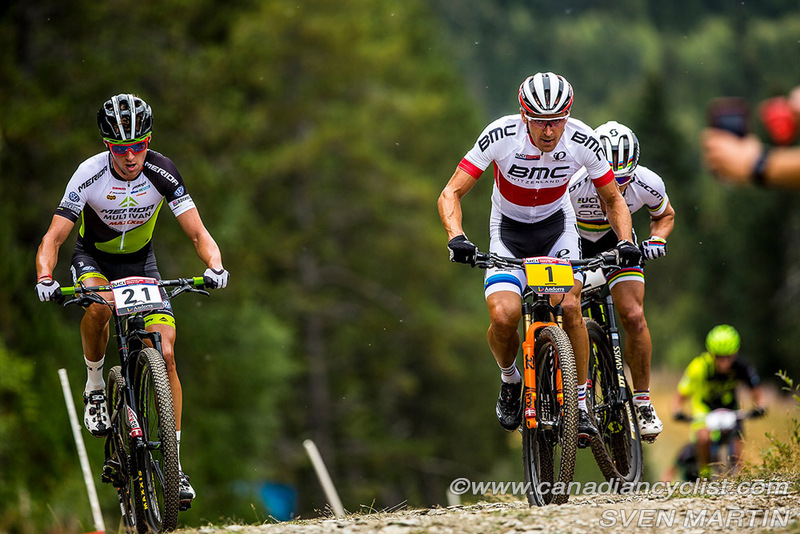 Schurter, despite missing one round, finishes second with three victories also, and 980 points. Marotte is third with 948 points. 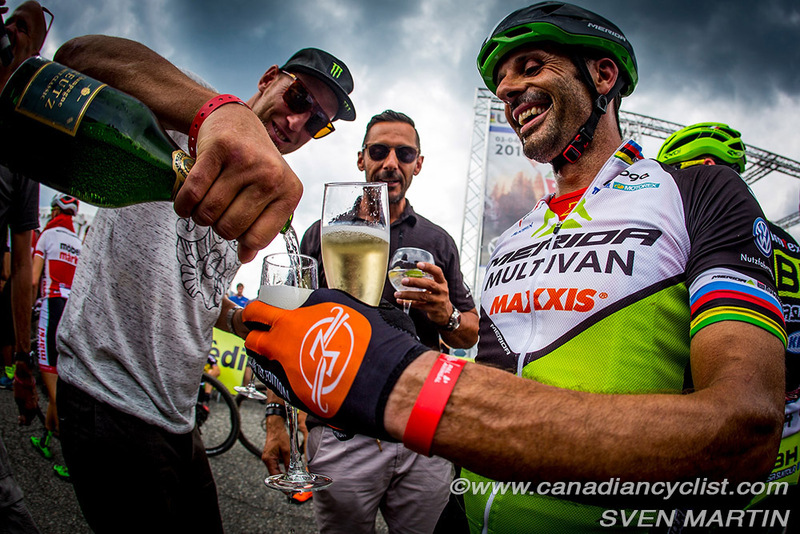 Leandre Bouchard (Cyclone d'Alma), who did not attend the final, was the top Canadian, in 31st place with 234 points, followed by Raphael Gagne (Cannondale fly360 p/b Sugoi) in 38th with 196 points. 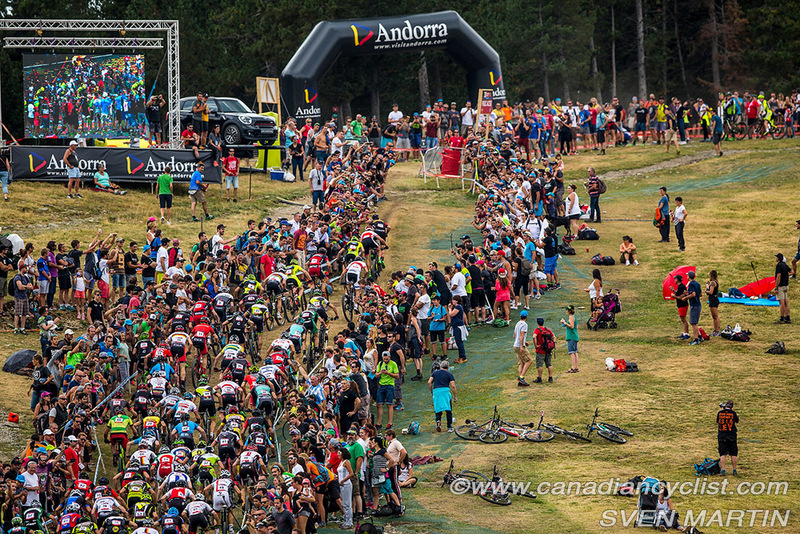 - This was Jose Hermida's (Multivan Merida) final World Cup (12th and 23rd overall). It caps a long and distinguished career that includes a silver medal in Athens and a world title in Mont-Ste-Anne. - Catharine Pendrel tells us that after some time at home she plans to attend the Cyclo-cross Nationals in Sherbrooke, and the first two rounds of the 'Cross World Cup (in the U.S.).